An American in Moscow: Anyone Heard of Spring? It is mid March here in Russia, and pretty much everywhere else in the world as far as I know. In the northern hemisphere, this equates to the beginnings of spring, and some places get an early start. Trees were budding in San Jose, California, when I was there in mid February. 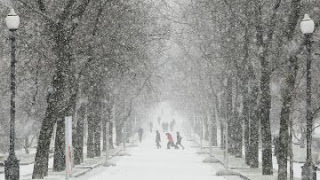 Moscow just got a new, fresh coat of snow. This will add nicely to the two-plus feet of snow accumulated on the erstwhile grassy patches in the parks near my place - and the snow has accumulated because there have been only a handful of days where the temperature has peaked just over freezing. And, there are no green shoots anywhere around to signal spring. Wait, is that a bird's chirping I hear? No, it was a passing car's squeaking. How do you like today weather? Looks like winter is getting some beating, no?